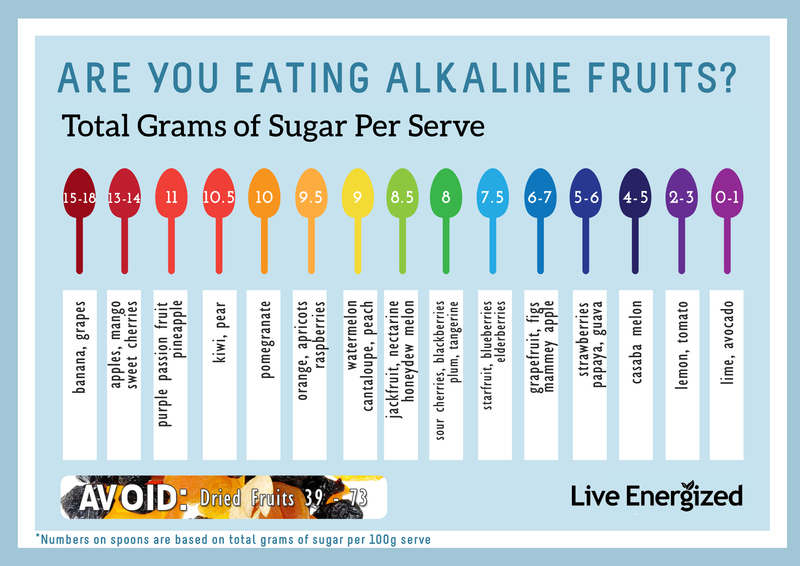 The question of which are the alkaline fruits is such an important one to understand when you’re first starting on the alkaline diet. Not all fruits are created equal, and while there are a lot of fruits you can eat with wild abandon, it is a mistake to think that all fruits are alkaline-forming and you can easily fall into the trap of over-consuming them. Yes, you can over-consume fruit. I’ll get onto this in just a moment, because first it’s essential to point out that most alkaline foods charts are dead wrong. There are a lot of alkaline food lists out there, and I know so many people get frustrated because they all seem to conflict with each other. The simple truth is that most fruits are not alkaline-forming. Think things like pineapple, banana, oranges, melons – these are commonly listed as alkaline fruits, but they are actually mid-to-very acid-forming. I know this could be a shock to a lot of people, so let me explain. If These Are Not Alkaline, Why Are They On the List As Alkaline In So Many Food Charts? The simple answer is that most charts are classifying the foods based on the PRAL method of determining pH (PRAL stands for Potential Renal Acid Load). In this methodology the food (or any other substance) is burned down to a fine ash, and the pH of the ash is measured. This is a hugely useful measure for many hundreds of clinical applications. But when it comes to food pH and our diet, it’s pretty useless. Why? Because it doesn’t take SUGAR into consideration. These fruits, like those I mentioned, the common fruits like bananas, pears, cherries, kiwi fruit, oranges, pineapple, apple and so on taste, well, really sweet and delicious. And they taste sweet because they have a ton of fructose in them! And fructose is a pretty damaging sugar for the body (I’ll get into this more in a minute, but basically fructose is the WORST of the sugars). Yes, they contain vitamins, minerals, antioxidants and so on, but when you look at the net affect these fruits have on the body, the sugar means they do more damage than good. So Are You Telling Us to AVOID FRUIT?! No, that’s not my point. I still think fruit is a wonderful treat and you should feel free to have 1-2 pieces per day (preferably organic and in-season). My point is that these fruits shouldn’t be eaten with wild abandon and seen as a ‘health food’ or free pass. Plus, when it actually comes to WHY I would eat fruit, it’s actually more to do with it’s taste and convenience over it’s nutritional profile. Research published in 2014 out of William Paterson University compiled the list of the world’s most ‘powerhouse fruits and vegetables’ based on the nutrient density and bioavailability of 41 different foods. Foods were awarded “powerhouse” status by providing, on average, 10 per cent or more of the daily recommended intake across 17 nutrients that have been proven to prevent and reverse chronic disease. SO of all of the fruits and vegetables they published the top 41. Of the top 41, 38 were alkaline forming foods …and of those the TOP FIFTEEN WERE ALL LEAFY GREENS. The only fruits to appear in the top 41 were strawberries, oranges and blackberries which were at 30, 33 and 38 respectively. So for a nutrient hit, I like to stick to my vegetables. They don’t contain fructose and they DO contain a lot more nourishment. Fruit, as delicious as it is, contains fructose. And fructose is be a problem. While most types of sugar can be metabolised by practically every cell in the body, fructose can ONLY be metabolised by the liver. We were not designed to eat the vast volumes of fructose we now eat. Regular sugars – table sugar, brown sugar, raw sugar, cane sugar – these are all 50% glucose and 50% fructose. Don’t get me wrong, the glucose is acidic, oxidising, inflammatory and bad news – but if you’re moderately active, the body can use it. Fructose cannot be used and it stresses the heck out of the liver, the pancreas and so much more. People think of fructose as a ‘natural sugar’, ‘fruit sugar’ or ‘healthy sugar’ but this is just not the case. It’s not only as damaging as any other sugar, but in reality – it’s actually worse. In short, fructose causes inflammation, liver stress, oxidative stress, uric acid formation, it makes us gain weight, we can’t stop eating it, and it makes us want to keep eating more. Not good. And fruit contains a LOT of fructose. These are not alkaline fruits! They are most definitely acidic, and we need to make sure we don’t eat, juice and smoothie a ton of them every day. In fact, see below for my rules on juicing fruits. You should definitely still eat these fruits, alkaline or not, 1-2 times a day because they’re a delicious snack, way more healthy than something that contains the sugar but NOT the vitamins etc. But it is clear to see that they are not alkaline fruits and shouldn’t be classified as such. There is a key distinction here, because we’re not actually talking about alkaline fruits or acidic fruits…we’re talking alkaline-FORMING fruits and acid-FORMING fruits. Remember this: It is not the pH of the food BEFORE we consume it that is the biggest influence, it is the EFFECT the food has on the pH of the body AFTER consumption. Sounds like a minor thing, but as you’re about to see, it’s very important. That’s it! And half of these you wouldn’t normally consider to be a fruit anyway! Now, I mentioned alkaline-FORMING before and this rule applies most clearly to lemons and limes. This confuses a lot of people because, as we all know, lemons and limes are acidic in nature. However, when metabolised they have an alkaline-forming effect on the body, and so are to be classified as alkaline forming fruits. Berries: strawberries, blueberries, raspberries etc. Before you ask about any other fruit, the easy answer is – if it’s not on the alkaline fruits list, it’s not alkaline. The acidic fruits list isn’t exhaustive! I strongly recommend you don’t juice, blend or dehydrate (dry) fruits. Eat them whole and raw. Fructose is far less damaging when consumed with fibre, chewed and digested slowly. When the fibre is removed (as with juices) it is even more rapidly metabolised by the liver. Same goes for dried fruits. These give a huge hit of fructose with very little fibre and immediately stress the liver. So there should be no fruit in juices (because the fibre is removed) and even in smoothies, because if your smoothie contained several serves of fruit and you drink the smoothie at a normal drinking pace, this would overload the liver very quickly (think about the time it takes to drink a drink vs to eat 2-3 pieces of fruit including chewing time). Really, it all comes down to the sugar content, as this pretty much overrides the nutritional content. So to keep it simple, you want to be eating less of the high-sugar fruits like pineapple, apple, oranges and bananas and instead, the alkaline forming fruits aside, sticking to the lower sugar fruits like berries and melons. Stick to those simple rules and you’re all set to continue enjoying fruits each day – regardless of their pH! I really don’t want you to freak out about fruits, but at the same time I don’t want you eating (and worse, juicing) a ton of fruit every day thinking that it’s healthy and fine to eat in huge quantities. The simple truth is that you CAN still eat a little fruit, but keep it within my rules and you’ll be set. Thank you Ross for this comprehensive clarification! It’s I think Acid Reflux I am suffering from I say I think because I have not been diagnosed but really strugging with pain and tiredness. In your recipes there are onions tomatoes etc and I thought I should not eat these. Please will you advise me. Ross, How does dried fruit lose it’s fiber when you dry it. The fruit loses water, right? Fiber too? I don’t understand how that would happen. Hey Ross, I think your articles are really interesting and often forward them on to people. However I’m struggling with what I can eat to give me calories to increase lean mass without eating much acid forming foods as it seems any foods containing much in the way of calories is acid forming? Thanks again for all your great info! I am interested in more information about your topics but unable to attend your webinars due to work schedule. Can I access that information another way? Also, I purchased several books related to the Alkaline diet but many contradict each other leaving me confused. I am mainly targeting a chronic heartburn… I also have a hiatal hernia. I also have Hashimoto and had a partial Thyroidectomy 8 years ago. Are Medjool dates alkaline or acidic? I have been concerned that I’m eating too alkaline. I eat only fruits and vegetables with organic hemp powder for protein. I thought that oranges turn alkaline after being ingested. I thought that the only acidic fruits are blueberries.. I’m hoping that you are correct in saying that kiwi and other fruits are acidic. I can eat more fruits to maintain a proper alkaline/acidic balance. Thank you. Hello I just wanted to say that reading all of this pas very helpful, ecpecialy because I was giving my 1year old a banana, pear, and apple smothie for quite some time thinking it was a good way for him to eat fruts. (Sometimes I would add honey till I read it wasent good for small children) I obviosly will change what I give him, but if you have and ideas on what would be a good replacement I would love to hear from you, because we all know children won’t drink lemons and grapefrut. Just starting to read about the Alkaline lifestyle. I have been eating and cooking whole foods for over 5 years and I am also tracking macros. I am looking to incorporate more of the alkaline foods to increase my energy and hopefully sleep better. I read everywhere that eating 80% alkaline foods is ideal. 80% of what? Daily calorie intake? And how much protein do you recommend? Thanks in advance.for some guidance. How acidic is raw honey?I probably eat too much of it.I use Wedderspoon Raw Honey from New Zealand. Is coconut oil alkaline forming food? What about sardines, apple cider vinegar and honey? Thanks! About fruits, makes a lot of sense! Love the Alkaline diet! I was just wondering. Do you have any info on inflammation. I have IT Band pain several months now and I think it’s related to sugar. I did ask you before in the blog but yet to get a response. That was a good article. I have a better understanding of fruits now. Please give me details information regarding pros and cons of consuming dry fruits. Hey Ross – Patricia Blick here checking in from Colorado. I had printed our your Cleanse & Recipe info in 2015 and then got distracted by two discovered non-cancerous tumors in my chest which had to be removed. Although they probably saved my life – I pick up several creepy things from the hospital and I am now in year three of working my way out of that. The latest Dr. in Internal Medicine did many tests and we discovered the last piece of my recovery was a fungal / mold infection. Just finishing the 12 week anti fungal / mold pills now and going into the 10 Day Cleanse / Detox and then continuing for 30 days~! I just wanted to thank you for all of your hard work and information – you are AMAZING. The favorite is your Recipe Book! So many great juices and smoothies – we love it – and the transitional recipes look awesome. We even have the Chanson Royale Alkaline / Ion Water System thanks to you – we are excited~! Thank you for all of your hard work, research and information – and for helping so many people. There is a lot of info out there but your work is spot on and you are incredible~! Thanks again and we love you~! Just a query about tomatoes: I had a conversation with a young woman recently who is dealing with candida and can’t eat tomatoes. If tomatoes are alkaline forming, why would they feed candida? What is the best “formula” to build an exceptionally strong immune system to fight anything that comes along and remain healthy without getting flues, colds, aches, etc throughout the year? I work with young children, eat fairly well, but always catch what they seem to have. Hi Ross you taught me so much about a alkaline lifestyle. I’ve seen a lot of charts and they all seem to be different, however I’ve been using your guides and i’ve been educated on how to live healthy. I trust your information 100% thank you for being so dedicated to helping us. Just wondered about berries. People in Norway became much healthier when they started eating lots of berries and our ancestors ate vast quantities of berries fresh and dried? What about fruitarians? There are lots of people who seem to thrive on a fruit only diet. I would argue that they’re setting themselves up for a huge amount of long-term issues. They are getting nutrients, and they’re not eating gluten, processed foods, excessive animal protein, dairy etc which is great, it’s why in the short term they’d be feeling OK. But in the long term they are going to have disastrous consequences from eating so much fructose. Thanks Ross….can you indicate what kind of problems would come to them if they are so alkaline? Do you have examples??? Thanks for your help. As you might have read in his article, most fruits are acidic. My understanding is that a fruitarian would more than likely have an acidic ph. Diabetes and high blood pressure are a few of the problems. Have you a similar alkaline list for herbs , spices and gingers? Thank you So Much Ross !!!!!!! January seems to be the month to place Holiday festivities into the memories catagory and focus again on eating a healthy Alkaline diet and bask in the joys of new memories from the Holidays. The resources you send out are WONDERFULLY AMAZINGLY SIMPLE AND AWESOME !!! 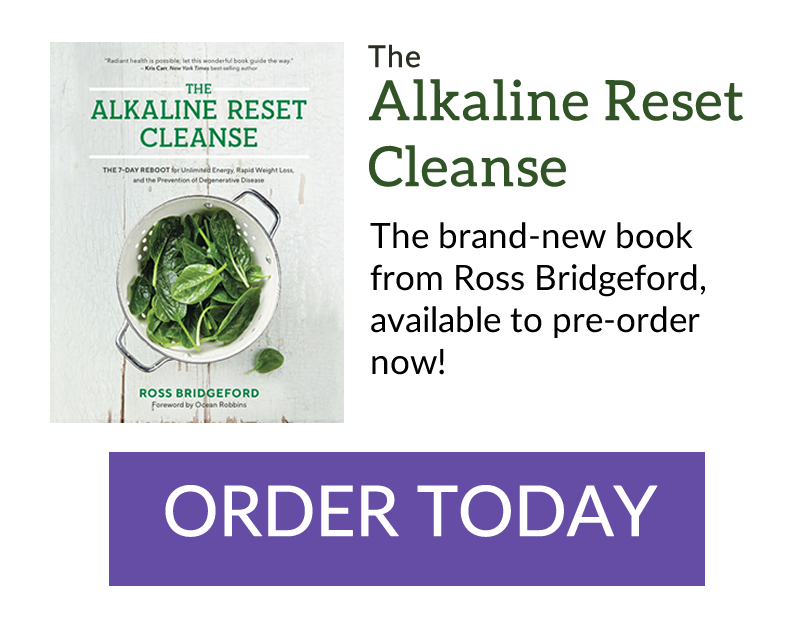 :)) They really help me to get back on track and in a away, redescover the Joys of the Alkaline diet and inevitability pick up some new Alkaline recipes and inspiration in the kitchen…. What a pleasure for me !!! Today I created an Alkaline dip for cucumbers (or any vegetables) it was a pinch of this and a dash of that BUT it turned out surprisingly Delicious !!! Ross, thank you for the inspiration you share with every resource, i know you pour your heart and soul into them THANK YOU SO MUCH !!! Thank you for your helpful article. Are you sure that your alkaline fruit list is complete? I noticed cucumbers are not on there. Hi Ross, I come under the ibs umbrella with slow colonic transfer, which means I have to sit on the toilet for a long time every day.! My doctor told me to eat prunes and they do help but after reading your fructose article I decided to ask your opinion. I know I’m better when I (but not strictly) follow the FODMAP diet. I await your reply. There are definitely better options than prunes for sure. Prunes are often recommended because they contain both fibre (about 0.7g per prune) and sorbitol. However, not only are there WAY better (less sugary) sources of fibre – sorbitol intolerance is also a huge, common issue in folks under the IBS umbrella. The prunes could be making things worse. I recommend looking to other sources of soluble and insoluble fibre that are more gentle on the digestive system and also containing none of the fructose in prunes, dates and other dried fruits that are often recommended. Look to things like chia seeds, psyllium husks, leafy greens, flax seeds/meal – and of course being super hydrated. I definitely recommend giving the psyllium husks a try – they’re really affordable and easy to use. Just try using 1tsp in a glass of water (followed by another glass of water) once a day. And again – hydration hydration hydration! I agree with Ross regarding constipation. I have a much softer stool when I hydrate properly. That’s around 3 litres of water (or non-sweetened herbal tea or non-sweet lemonade) per day for me. Also, I’ve never had a stool problem on a raw vegan diet or just a vegan diet (without sugar and food made of white flour) even when not drinking a lot (say 1 litre of water daily), because all of the food I consumed contained a lot of water and had plenty of fibre. If you eat plenty of dry food, that will certainly clog you up. Good luck and great health to you.